The Irawo TV channel, aired on the Play TV platform, is set to launch a breakfast show on October 1. Irawo Owuro, meaning ‘morning star,’ is an early morning breakfast show in Yoruba that will address issues around lifestyle, culture, happenings in society and skill development. It will air on Monday, Wednesday and Friday between 08.00 and 09.00. The show will comprise three segments looking at culture, entrepreneurship and skill development, plus a discussion section. There will be a guest speaker and the show will be anchored by Sogo Morenikeji and Oluwabusayomi Sulaimon. Grace Ihuoma Essen, the channel’s manager, said: “The Yoruba race is very educated and highly skilled and we want to enrich the lives of our viewers by bringing them a breakfast show that will showcase the rich cultural heritage and lifestyle of the Yorubas. Irawo Owuro can be found at channel 300 on Play TV. 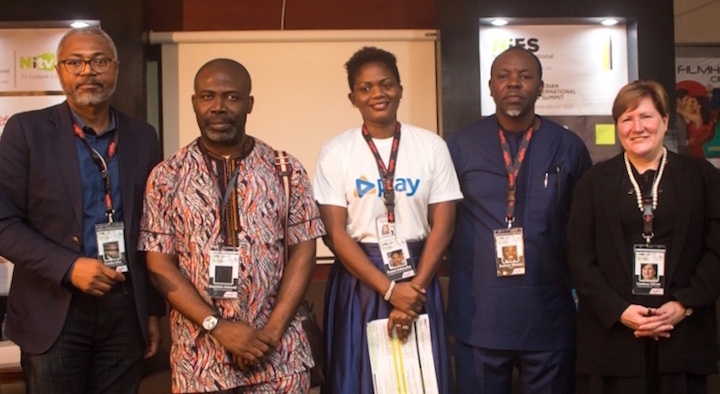 The first panel session at the Nigeria International Television (NITV) Summit focused on the challenges and opportunities facing the country’s pay TV industry. Addressing the issue of sustainability and growth in the pay TV business in Nigeria, panelists discussed the challenges and ways in which these can be overcome. Panelists included Funmi Adenaike, general manager of Play TV; Emeka Mba, former NBC director general and now CEO of Questechmedia Consulting; Bamidele Adetunji, CEO at Montage Media Group; and Zachary Wazara, CEO of Kwese TV. The session was moderated by Lindsey Oliver, CEO of Yanga TV. The conversation kicked off with an evaluation of the industry as a whole and how it has evolved so far. Panelists agreed that rapid development of technology poses a challenge for pay TV platforms. “The internet is changing consumer behaviour and business models,” said Wazara. Meanwhile, despite agreeing that other industries are threatening the growth of the TV industry, Adetunji stated that the challenge to sustainability is a lack of proper recording technology and archiving. “There was time I wanted to produce an epic Nigerian movie but was told it was unavailable because a recording had been done over the master recording, which basically means it no longer exists. “And this leads me to ask, who has the rights to TV series like [classic Nigerian drama] Village Headmaster? Where are our formats? Where are our records? There are no local formats, yet international formats still exist,” said Adetunji. Speaking about the way forward, Adetunji suggested that Nigeria should establish a commercial satellite platform so local pay TV channels don’t have to form partnerships with international satellites and pay “astronomical” amounts to air content. This is especially true when consumers do not understand a pay TV channel’s need for high prices because all they want is content at a low cost. 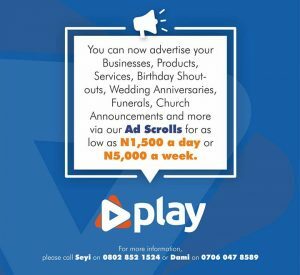 Nigerian cable network Play TV is giving advertisers the chance to promote products to audiences across the nation on ad scrolls for as low as N1,500 per day. 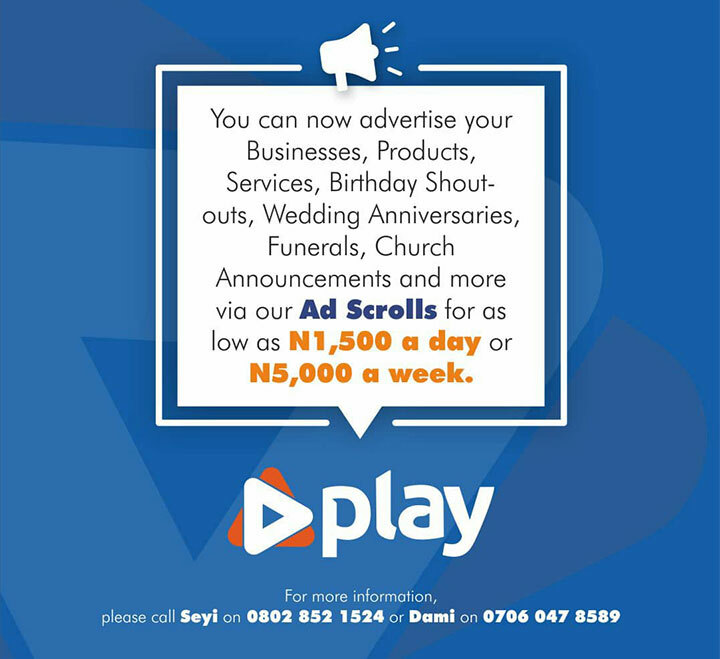 Ad scrolls can be purchased for N5,000 a week, meaning announcements from birthday shoutouts to product ads can be made on the pay TV platform. Interested advertisers should contact Dami on 07060478589 or Seun on 08028521524. Play TV, formerly known as ConSat, offers all-round entertainment via more than 40 channels. Channels exclusive to Play include HFATV, VOTSTV, Irawo and 1 Comedy. Creative Nigeria Summit 2018 wrapped up successfully on Tuesday with a full day of in-depth masterclasses and industry discussions. 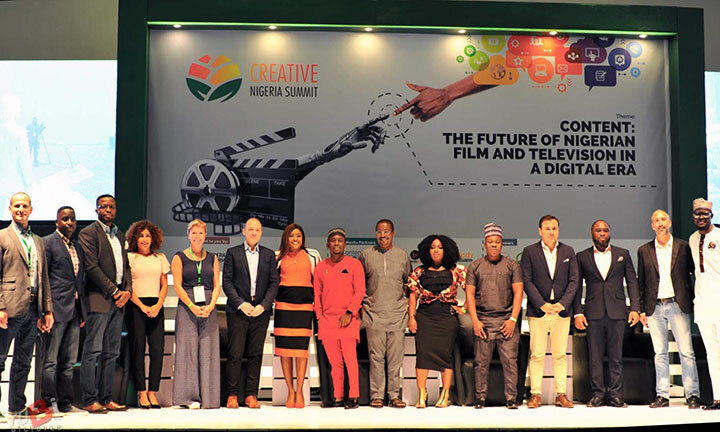 The second and final day of Creative Nigeria Summit (CNS) 2018 kicked off with a plenary discussion focused on coproduction that featured Sanjay Salil, MD of MediaGuru, Waterstone Entertainment CEO Jeff Kallegheri and producer and host Eunice Omole and was moderated by Africa MediaWorks CEO Lindsey Oliver. According to the panel, the key to the right coproduction is focusing on the fundamentals, by looking at your environment before going to Hollywood. They all agreed that building relationships locally is essential for growth, although honesty and good reputation are also key. In his keynote speech, Vesselin Shaoulov, CEO of GARB Audience Measurement in Bulgaria, gave an in-depth insight into the importance of audience measurement within the television and film industries. During his presentation, guests were made aware of the processes involved in audience measurement and ratings. “Effective and successful media products target the right audience and communicate with them in an effective way. As the media industry becomes more fragmented, so competition for the audience share becomes more intense than ever. Knowing precisely who your target audience are and what makes them tick is therefore increasingly important,” said Shaoulov. Offering a completely different perspective on retaining audience attention, Nigerian writer Tolu Ajayi returned with another masterclass, this time focusing on the power of telenovelas and how to create them locally. “Firstly, you must legally acquire telenovelas to adapt them. Then you write in your own backgrounds and characters in a way that your viewers can relate to but ensure that in editing you keep it as close to the original as possible,” he said. The secret to international formats Anahita Kheder, senior VP for the Middle East, Africa and South East Europe at FremantleMedia, gave her take on the secret to international formats: “Use the right platform for the right audience and generate revenue for your local content by going global,” she said. “You don’t need to produce a pilot to share your content. Why not sell your story instead, sell the script and have someone else produce the film, but ensure that your rights are protected. “Sometimes being on TV is unnecessary – try digital instead. Many projects began on a digital platform. At FremantleMedia, we don’t leave the virality of our content to chance. If we want it to go viral we put in the work, we put ourselves out there, making sure our content remains relevant to audiences around the world,” said Kheder. In a panel session moderated by Africa MediaWorks’ Oliver, Play TV chief Toyin Subair asked a panel of advertising agency and media execs – including Viacom Africa’s Bada Akintunde; Anthony Ekun, creative director at SO&U; and Tolulope Ajayi, branded content manager at Insight Communications – to address the issue of “unfair mediation” by agencies in the media industry. “You are the ones who will lose if brands go digital without the interference of agencies, so I ask: what solutions do you propose to this, because you make more money out of these deals. You’ve stated the problems and directed them at the producers and directors, but where do you come in?” asked Subair. Akintunde replied that he couldn’t speak for the other agencies but believes that the media industry should jointly deliberate on how these issues can be solved. However, the panelists agreed that brands are becoming more forthcoming with audience engagement and are improving the content they produce, making each advert relatable to its target audience. Elsewhere, Ed Waller, editorial director of UK publisher C21Media, delivered a report on the international formats market. “The value of the global formats industry has more than doubled since 2004 and demand for local programming is the key to this growth,” he said. The last plenary discussion was about the effectiveness of social media in the media industry. The session was moderated by Tobi Balogun, CEO of TobyDonut, featuring Tiwalola Olanubi, lead creative at DottsMediaHouse, and Olufemi Oguntamu, CEO of Penzaarville Africa, who spoke about the importance of social media to marketing. According to the speakers, social media is a way to advertise as though you are not advertising. In that way you get people talking about a movie long before it begins to air and it helps to keep your audience interested and engaged. “If you are a producer, you don’t need to fight to get your content on TV – try digital media. That’s what [child comedian] Emmanuella did with YouTube. However, you need to understand that what worked yesterday may not work today, but always bear in mind that getting content on social media doesn’t require a huge budget,” said Balogun. The event wrapped with a vote of thanks from Taiwo Olakunle, MD of Think Tank Media & Advertising, organiser of Creative Nigeria Summit. Play TV is set to launch an indigenous TV channel and is seeking presenters to host its content. 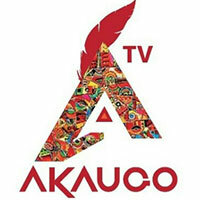 Akaugo TV needs presenters who can speak Igbo fluently. Auditions will be held at 1 Continental Way, off CMD Road, Ikosi-Ketu, in Lagos on June 13 from 10.00. Formerly known as ConSat, Play TV is a Nigeria-based pay TV platform that offers entertainment across more than 40 channels. Channels exclusive to Play include HFA TV, VOTSTV, Irawo and 1 Comedy. Play TV presenter and producer Labi Olayori tells Content Nigeria about her life and career, and reveals details of her new celebrity interview series The Other Side. 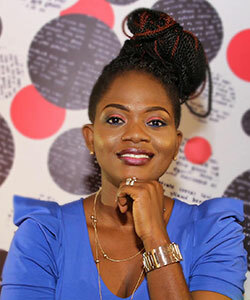 She tells Content Nigeria about her journey as a presenter and relationship counselor, and her experiences being a brand ambassador for Nigerian cable TV network Play TV. I am a Nigerian, a mother, a wife, a next-door-girl. I love to help. Before The LABI Show on TVC, you presented Entertainment Splash on the same channel. Before I joined TVC, I worked at a cable network, MCTV. Upon joining TVC, I began Entertainment Splash, which was initially called Lunch Splash. I found that while presenting Entertainment Splash, most callers would request songs to soothe their broken hearts or troubled minds. That was what spurred me to begin my relationship show again, because I got tired of talking to artistes about their careers when there were so many people with emotional issues who I could help. Since I started The Labi Show, I’ve interviewed artistes such as Brymo and Chidinma, focusing on their relationship and life outside their careers. What brought about The Labi Show? When I was growing up I was always very curious. I would wonder about the attraction between a couple, especially if something looked odd or they seemed unhappy. I discovered there was more to what I saw and I always wanted to know what it was. The Labi Show is about people with issues; people who want to share their burden with someone, talk about it. It is not about judging people because I have been through a lot and I know what it feels like to have people judge you. That was why I started the show 15 years ago. The show has been on-air for 15 years? Yes! I started this show on a cable network called MCTV. It was called Emotions & Feelings with Labi at the time. I have always wanted to be attached to my viewers. Have them talk about more than the mundane, I want to be able to cry with them, feel what they are feeling. I do not judge. I remember a time a viewer called, talking about the difficulties of being a single parent and I cried with her. Isn’t it hard getting in touch with your feelings when you are not the one feeling it? I am an emotional person. Okay, someone calls on a live show and tells me they’re unhappy and that just gets me. I mean, they are calling with their airtime, the generator is on because there is no power supply and they are telling me they are unhappy. The first thing I think of is how to make them happy. I empathise. What has been your most interesting experience on the show? I remember a man once called to confess that he had cheated on his wife with her friend who was his ex-girlfriend. He said he was being eaten by guilt and didn’t know what to do. So, I advised him to wake her up to tell her. He did and called afterwards to tell me that she went back to sleep without saying anything. I advised him not to sleep as I believed that was a scary reaction, one that might beget a dangerous situation. After that night, I introduced the couple to a marriage counselor. The Labi Show is very emotional. At one point, after I began one-on-one counselling sessions with people, I had to get a counselor for myself because it was draining me. When what you do is about passion, you get emotionally involved, tending to neglect your own life. So I got a coach, Praise Fowowe. I told him that I needed to cry for myself, not for someone else. In 2017, you moved from TVC to Play TV. What led to that move and how has it been so far? I remember in April 2017 my son asked if I had plans outside TVC and I said: “TVC is TVC, Labi is Labi.” He disagreed and said he wanted me to become an independent producer. Chidinma also suggested the same thing to me. This happened in April 2017, before I was let go from TVC in June. That was when I knew Chidinma and my son were mouthpieces of God. In less than three months, I was asked to come over to Playas a producer and presenter with more leeway than I had at TVC. When I left TVC, I had companies ask me to be their brand ambassador and it wasn’t about TVC, it was about me. It was hard at first because of the emotional attachment I had to TVC, having worked there for 10 years. The Labi Show airs by 21.00 on Play but when it was on TVC, it aired by 23.00. Why the change to the earlier timeslot? It’s because Play is a cable network. On TVC, when it was aired at 23.00, I didn’t get to sleep after the show. I would pick calls from viewers afterwards, from midnight till 04.00. So when I brought the show to Play, I said I no longer wanted 23.00 since I wanted to be home by midnight. Now, the show starts by 21.00, ends by 22.00 and the calls continue till midnight. I go home after that. I needed to change the status quo. If I am not healthy, I’d be unhelpful. What do you have planned for The Labi Show this year? Is there any new content for Play? Yes, I have new content planned. I have the annual boat cruise for The Labi Show. On TVC, it was done only during the Valentine’s Day period and only for fans in Lagos. But now, some state governors will be partnering on the boat cruise and may attend, so it will also be done in other states and during festive periods. I also have a new show coming up. I have shot six episodes so far. It’s called The Other Side. As the name denotes, The Other Side will be showing the other side of celebrities and well-known individuals, a side that fans rarely see, their emotional side, their family, their home. One episode features Akinwunmi Ambode, the Lagos state governor, talking about how he relaxes. Another features showbiz couple Tunde and Wunmi Obe taking us on a tour of their home, which includes a lounge, club, several rooms within rooms, their dogs’ houses and more. I can’t wait for viewers to see what we have in store. This unscripted show is exclusive to Play. What challenges do you face doing your job and how do you overcome them? I’ve gotten so used to it that I have a permanent smiling face. It’s a crazy world where people expect you to be perfect all the time. Also, I’m not much of a make-up person, I prefer the natural look. So once I’m off-air I do away with all the glamour. I like being ordinary. The Labi Show airs on Friday at 21.00 on Play TV channel 400 and Free TV channel 711. It also airs on Thursdays at 22.00 on Rave TV and Mondays at 22.00 on WAP TV. An online fashion and beauty directory aimed at Muslim women in Nigeria has launched its first TV show exclusively on HFA TV. Muslimah Style Guide debuted last Friday on HFA TV, channel 200 on Play TV, and will air weekly at 20.00. The series is devoted to celebrating brands that cater to the fashion needs of Muslim women in Nigeria, marking the first fashion-focused TV content to target this demographic. Muslimah Style Guide is anchored by Oyinkansola Fatima Momoh, a managing consultant who runs the only style consulting company for Muslim women in Nigeria. Momoh hosts different Muslim women at the Muslimah Style Guide Hub, a private, women-only space in Lagos that serves as a place for women to learn and understand Islam. Muslimah Style Guide is distributed and licensed by HFA TV, and coproduced with Insigna and Muslimah Style Guide Ltd. HFA TV is Africa’s foremost 24-hour fashion channel. 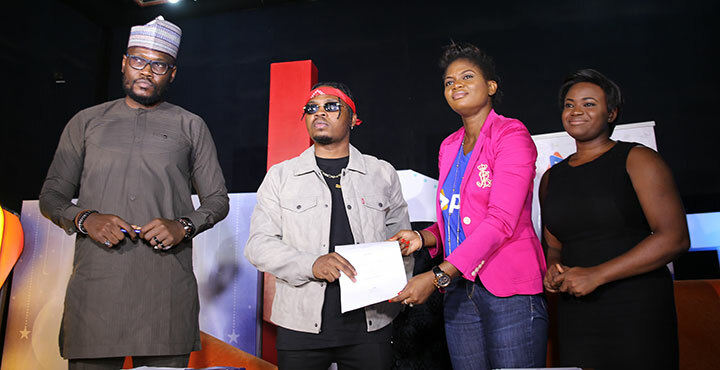 Nigerian musician Olamide Adedeji, also known as Baddosneh, will be joining Play TV as a brand ambassador, the cable network has announced. 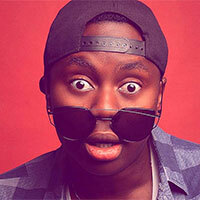 Adedeji was named as the network’s latest ambassador this week when he signed an endorsement deal with Play. Adedeji commended Play for its commitment to the creative industry in Nigeria. “I would like to thank Play TV for choosing to work with me and bring me onboard for this project. For me, this is a ground-breaking move. It’s a major thing for Nigeria. It’s a major thing for Africa,” he said. Adedeji was welcomed by staff of Play and other Play TV ambassadors, including TV presenter Labi Olayori and Nollywood actress Adediwura Adesegha (aka Blarkgold). 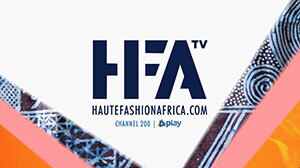 African fashion website Haute Fashion Africa (HFA) has launched its linear TV network exclusively on Nigerian pay TV platform Play TV. Occupying channel 200, HFA TV features programmes that focus on the fashion industry in Africa. Shows go backstage and into the front row at fashion shows, highlighting various fashion stylists, designers and models. Shows in its launch line-up include ICYMI: Haute Outside, Haute List Top Dix and Shop My Closet. HFA has been an online destination since 2006. Speaking about the channel launch, HFA TV CEO Oluwadamilola ‘Wadami’ Amolegbe said: “For a decade, the Haute Fashion Africa brand has maintained its commitment to being a platform profile for African designers exhibiting a taste for the cultural. Pay TV platform Play TV, formerly known as ConSat, offers a wide range of entertainment, from kids’ shows to sports, news, music and movies. It has more than 50 channels, some of which are exclusive to Play TV, such as HFA TV, 1 Comedy, 1 Music and Irawo TV. Pay platform Play TV’s channel Irawo has launched a show that celebrates Yoruba movies. Sinima Mi, which debuted on January 22, focuses on the cast and crew who work in films made for the Yoruba community and looks behind the scenes during production. The programme is hosted by Adeshina Kasali, better known as Medullar, and will air on Saturdays at 18.30, with a weekly broadcast on Tuesday at 19.00. 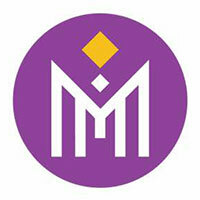 Sinima Mi was created by ArtsBeat Media and produced in partnership with Play TV. Irawo can be found at Channel 300. Nollywood actress and TV presenter Adediwura Adesegha, popularly known as Blarkgold, has held a lunch party to celebrate becoming a brand ambassador for Play TV, reports Gabriella Opara. The celebration was held on January 17 at Gei8 Hotels in Surulere, Lagos, and was attended by Adesegha’s friends and family. 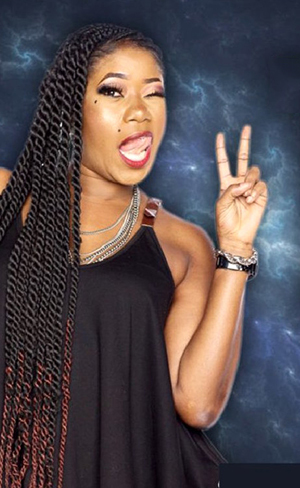 She added that she is currently producing movies and presenting talkshows – The Ladder and Injinji Aiye Mi – that will be exclusive to Play TV. Injinji Aiye Mi will air on Irawo TV on the Play platform and will be about the lives of various Nigerian celebrities. It was announced last month that Adesegha would be a brand ambassador for the cable platform alongside Labi Olayori. 1 Music and Irawo air on channels 400 and 300 respectively on Play TV. Cable platform Play TV has added a 24-hour Yoruba entertainment network to its channel line-up. Irawo – meaning ‘star’ in the Yoruba language – is now airing exclusively on the pay TV platform’s channel 300. Described as “a bridge between the young and old Yoruba audience,” the channel showcases movies, music, entertainment and lifestyle, and is has a high level of indigenous content and entertainment. 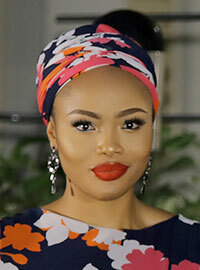 Irawo debuts with programming such as CookSpot, hosted by popular Nollywood actress Arewa, who brings guests into her home to cook their favorite meals. There’s also Oko Ataya, dedicated to couples and the sensitive issues of marital life, while talkshow The Ladder is hosted by popular Yoruba actress Adediwura Blarkgold. Sinima Mi, meanwhile, is about people who make movies. According to Play general manager Funmi Adenaike, the channel was much anticipated by Play subscribers. 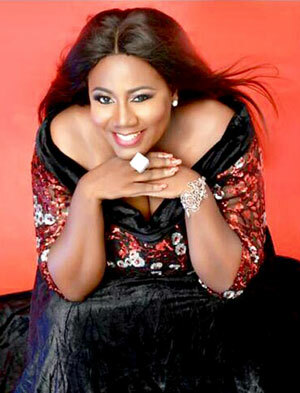 “Irawo is one of the many steps we are taking to deliver our brand promise of telling the unique and beautiful Nigerian story to the world,” she said.